Ch'ŏngam-guyŏk is a district of the 7 kuyŏk that constitute Chongjin, North Hamgyong Province, North Korea. Chongam-guyok is divided into 21 neighbourhoods (tong) and 6 villages (ri). Puyun-guyŏk is a district of the 7 kuyŏk that constitute Chongjin, North Hamgyong Province, North Korea. Puyun-guyok is divided into 7 neighbourhoods (tong) and one village (ri). Sinam-guyŏk is a district of the 7 kuyŏk that constitute Chongjin, North Hamgyong Province, North Korea. Sinam-guyok is divided into 10 neighbourhoods (tong). Ranam-guyŏk is a district of the 7 kuyŏk that constitute Chongjin, North Hamgyong Province, North Korea. Ranam-guyok is divided into 19 neighbourhoods (tong) and 2 villages (ri). P'ohang-guyŏk is a district of the 7 kuyŏk that constitute Chongjin, North Hamgyong Province, North Korea. Pohang-guyok is divided into 14 neighbourhoods (tong). Sunam-guyŏk is a district of the 7 kuyŏk that constitute Chongjin, North Hamgyong Province, North Korea. Sunam-guyok is divided into 9 neighbourhoods (tong). 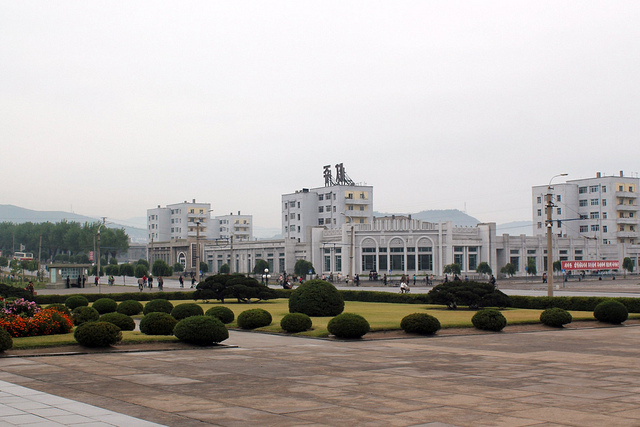 Ranam Station is a railway station located in Ranam-guyok, Chongjin, North Korea. It is located on the Pyongra Line, which connects the capital, Pyongyang, to Rason, a major port city. Songp'yŏng-guyŏk is a district of the 7 kuyŏk that constitute Chongjin, North Hamgyong Province, North Korea. Songpyong-guyok is divided into 13 neighbourhoods (tong) and 5 villages (ri).